Our first visit to Denver was in 2010 to visit some friends. Since then, we’ve visited again and even lived there for a few months. Colorado’s capital has a lot to offer and is also a great jump off point for some other nearby adventures. Here are our favorite things about Denver and why we think you should visit. There’s a lot of great food in Denver. From classic American fare to Middle Eastern food, Denver has it all. We’ve had Greek burgers with gyro meat, feta, and tzatziki sauce. We’ve had amazing hummus. We’ve had to die for crepes. You name it, they’ve got it. Breakfasts in Denver are also a pretty big deal! Denver has world class museums. The Denver Museum of Nature & Science and the Denver Art Museum are probably the city’s most popular museums. With permanent and rotating exhibits, everyone can find something that will peak their interest. For such a metropolitan city, Denver has a lot of green space. Visitors can enjoy over 4,000 acres of traditional parks and parkways around the city. Our favorite is City Park, considered Denver’s version of New York City’s Central Park. And last, but certainly not least, one of the best reasons to visit Denver is to enjoy the great outdoors. No matter where you are in Denver, you’re within a short driving distance to mountains, state parks, and plenty of other areas that nature lovers will love. It’s a hikers paradise, especially because hikers of all skill levels can enjoy their surroundings. Even this city girl was able to climb to the top of two 14ers! You can always venture a little further out as well. We recommend a visit to Garden of the Gods. It’s about an hour and a half south of Denver and you can see really cool formations, including two kissing camels! 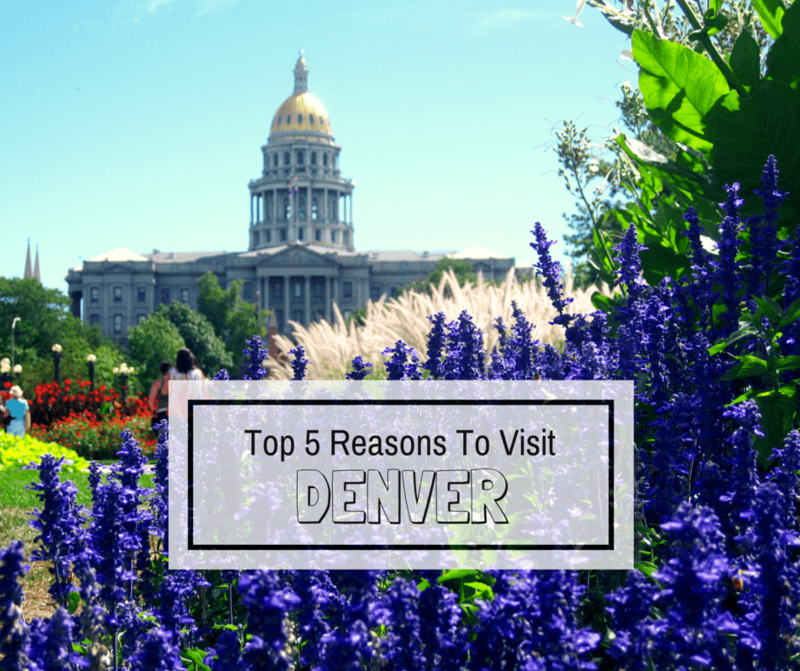 So there you have our top five reasons to visit the Mile High City. We think Denver is great and it’s become a second home for us. We hope that this post has inspired you to visit. Maybe we’ll see you there! Denver is amazing. I am returning in a few months. Looking forward to exploring more. I loved visiting Denver. I’d add a sixth reason: Beer! I highly recommend the Denver Art Museum, Great Divide Brewing Co., and Pizzeria Locale. Hi Erin! I’m not a beer drinker so I’ve actually never been to any of the many breweries that Denver has, but that is a great suggestion for others. Thank you! It’s amazing how many areas there are to get outside for a nice walk or hike in Denver! Such a beautiful area! I will definitely be back to the Mile High City soon! Garden of the Gods is definitely on my travel list for October plus I score box seats to the Denver Broncos. Woohoo!! OMG Mel, you’re going to have so much fun!! Denver is one of the US states I know from a sports perpective….not really sure why? Lots of great things to do here….looking forward to getting to see them some day. Haha! That’s understandable Kerri, they have a lot of great sports teams. I hope you’re able to visit one day! Colorado has way too many nice places, gotta go for sure and will stop by Denver no doubt!! It’s been too long since I’ve visited and you have given me more incentive to visit soon with all those choices. Glad to hear that Noel! When I think of Colorado, I think more of Aspen and not Denver. However, I sure would love to check out Garden of the Gods. Even the name alone intrigues me. Denver is a really nice city, and you can pair it with many of the wonderful outdoor activities that are near to the city. I prefer Denver in the Winter, though – crazy, perhaps, but it is incredibly beautiful. Haha! It is beautiful in the winter John, but very cold! Very informative. Denver looks so awesome thry your eyes. Would certainly like to exploreThe Denver Museum of Nature & Science and the Denver Art Museum for sure. This is such a beautiful place! You make me wanna go there soon. You’re right about Denver! I love the food, museums, parks, touring the broncos stadium and taking in the scenery! I’ll definitely come back and do some of the nature stuff outside of the city. Love this list! Denver is one of my favorite cities and I love the easy access to nature. These reasons are really good, Buddy! Loved the post!